Last year, Zoya introduced Gems and Jewels, a small collection of 6 polishes made up of 3 metallic shimmers and 3 corresponding bar glitter topcoats. When I received them for review, it was during the time where I was unable to blog, so I never got around to swatching them and reviewing them. 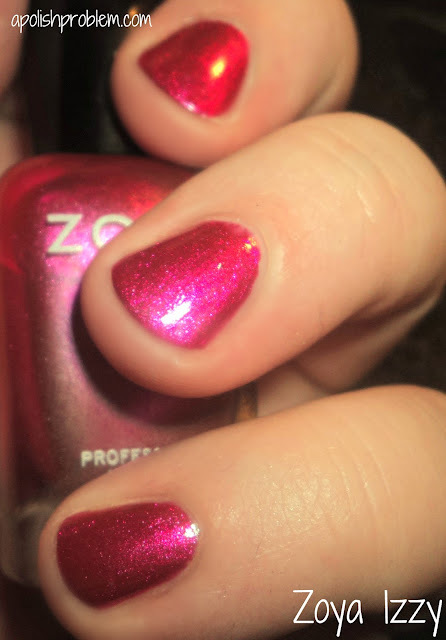 This is Zoya Izzy, a bright pink metallic shimmer, by herself. The 2 pictures above show 2 coats of Zoya Kissy, a dense glitter topcoat with fine pink bar glitter, pink microglitter, and holo bar glitter, in a clear base, over 2 coats of Zoya Izzy. I love this one. The application on both of these was perfect. I had no glitter drag with Kissy, which was a big plus. I know these were released during holiday 2011, but I think Izzy, either with Kissy or alone, would be perfect for a summer pedicure. Zoya Izzy and Zoya Kissy are still available on Zoya's website*. 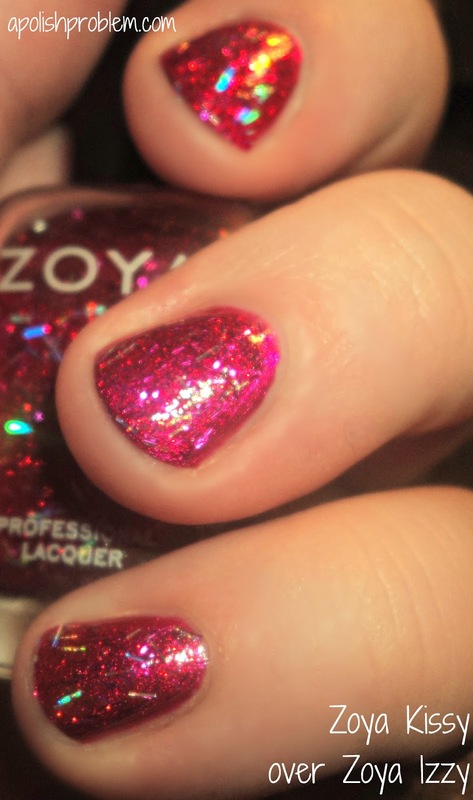 Zoya polishes retail for $8 a bottle. I loved this collection, but Holly really stood out for me. This is quite stunning with the bar glitter, though. my gosh, everytime I get new Zoya polishes I see a new one that I don't have and I NEED... I LOVE Izzy!!!! I have Holly, but I have yet to wear it. It looks super pretty in the bottle.